One of the central questions in macroeconomics is why income per capita differs so dramatically across countries. The companion policy question is what low-income countries can do to bring about sustained improvements in their average living standards. Unfortunately, economists are still a long way from delivering reliable policy recommendations about how to create development. Good policy recommendations require a clear understanding of the determinants of development, and research on this important topic is still in many ways in its infancy. Unfortunately, the conclusions from development accounting are only as reliable as the cross-country data on output per worker and productive inputs per worker, and neither are measured with great precision. Consider the basic question: Do adults in rich countries work more hours on average than adults in poor countries? Existing cross-country evidence does not provide an answer, even though aggregate labour input is one of the basic components of productive inputs. Conventional wisdom says that low labour effort could be the cause of low income in the tropics, where most of the world’s poor countries are located. Landes (1999), for example, emphasised how the hot and humid climate of the tropics made it very difficult to supply labour. Our new paper is the first to assemble an internationally comparable data set on average hours worked per adult across the full world income distribution (Bick et al. 2016). Much of the paper addresses measurement issues that have hampered cross-country comparability in previous studies, like how to deal with multiple jobs (we include all of them) or jobs that may be informal (we include them) or which measure of hours to use (we use ‘actual hours last week,’ not ‘usual hours per week’). We also deal with seasonality of hours over the year by only relying on surveys that cover the whole year. We do not want to include surveys that cover a country only during one month, which may be the period right before the harvest when workers are mostly idle, or mid-August, when Europeans all seem to be taking their synchronised beach holidays. Note: The vertical dashed lines refer to the level of GDP per capita at the first and second tercile in the Penn World Tables 7.1. For reference we show the mean hours per adult per tercile for our sample of countries at the respective mean GDP per capita. Figure 1 plots the average hours across our main set of 43 countries, and the averages by income tercile. Our main finding is that hours worked per adult are about 50% higher in poor countries than in rich countries. In our sample countries from the poorest third of the world income distribution – which include Uganda, Vietnam, Tanzania, Cambodia, and others – the average adult works 29 hours per week. In the richest third – which includes among others the US, Spain, Germany, and France – adults average just 19 hours per week. As a frame of reference, this difference of 10 hours per week is around twice the difference in hours worked in the US over the 20th century, which is 4.7 hours per week (Ramey and Francis 2009). Studies of labour supply typically divide hours of work into two margins: the extensive margin, which is the fraction of adults working at some job; and the intensive margin, which is the number of hours worked conditionally on having a job. We do the same. Both margins matter for our results, but in a different way. On the extensive margin, employment rates are very high for the poorest countries, at 74% on average. Once we move to the middle income countries (like those in Latin America), employment rates fall to around 53%. In the richest countries they are of comparable magnitude. 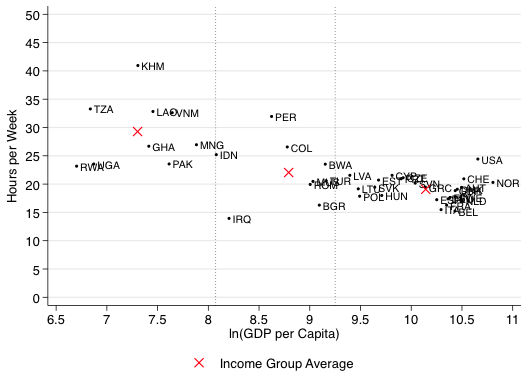 The intensive margin behaves differently – it is still higher in poor countries, but of similar magnitude in middle income countries, and then falling from the middle to the rich. To help understand why hours are higher in poor countries, we cut the data in a number of ways, namely by gender, education, age, and sector. The main fact of higher hours worked in poor than in rich countries arises very robustly for all the groups. Quantitatively, some groups show larger differences than others – e.g. women more than men, or older workers more than prime-aged workers – but the differences are there for all groups except workers in agriculture, which constitutes a very small share of workers in the developed countries. What does our paper imply for the understanding of the determinants of cross-country income differences? First, we revisit the development accounting literature. Using hours worked as an input instead of number of workers, as is typically done in the literature, makes the productivity puzzle worse. Our findings are not consistent with theories based on lower labour input by poorer countries. Adults in poor countries work a lot, and are even less productive than we thought. We also tie in to a broader debate about whether income differences capture welfare differences. Economists are interested in welfare, after all, and not just chasing the statistic of GDP. In a very clever recent paper, Jones and Klenow (2016) devise a nice methodology for measuring welfare differences across countries, building on the famous ‘veil of ignorance’ theory of Rawls. To move to an average high income country and to get a fraction lambda of this country’s consumption and work the average hours there. We ask which lambda makes the agent indifferent between staying and moving to a rich country. The answer is our measure of welfare for the country in question. For this exercise, we need to take a stand on preferences. We use a variant of the standard neo-classical growth model, following the literature analysing differences in hours worked between the US and Europe (e.g. Prescott 2004). The key modification is a non-homotheticity in preferences in the form of a subsistence consumption requirement as in Ohanian et al. (2008). We first show that the calibrated model is quantitatively broadly consistent with the facts we document. Using the model, we find that welfare differences are much larger than suggested by GDP differences alone. If we calculate the welfare differences assuming the same level of hours in all countries, and differences only in consumption, then average welfare in the top third of the world income distribution is 16 times larger than average welfare in the bottom third of the world income distribution. This is equal to the ratio of GDP per capita across these two sets of countries. Once we add differences in average hours worked, we find that people in the richest third of countries have at least 22 times the welfare of those living in the poorest third. The lower is the elasticity of labour supply assumed in preferences, the larger the welfare differences across countries once hours are taken into consideration. A large literature (e.g. Aguiar and Hurst 2007, Ramey 2009) has emphasised broader notions of work, including hours spent on home production of services such as time spent cooking, cleaning, or in child care. How do ‘home production’ hours vary between poor and rich countries? We compile and analyse data on these categories from a smaller set of countries that have broader time use modules. We find that people in poor countries spend more hours on these tasks too, on average. This makes sense, as residents of poor countries have fewer time-saving durables, such as dishwashers, and more children, implying more hours of child care. To summarise our results succinctly, residents of poor countries are not just ‘consumption poor’, as one concludes from existing data sources; They are also ‘leisure poor’. Aguiar, M and E Hurst (2007) “Measuring trends in leisure: The allocation of time over five decades”, Quarterly Journal of Economics 122(3), 969–1006. Bick, A and N Fuchs-Schuendeln and D Lagakos (2016) “How do average hours worked vary with development? Cross-country evidence and implications”, Unpublished Working Paper. Caselli, F (2005) “Accounting for cross-country income differences”, in P Aghion and S Durlauf (eds), Handbook of Economic Growth. Hall, R E and C I Jones (1999) “Why do some countries produce so much more output per worker than others?”, Quarterly Journal of Economics, 114(1): 83–116. Hsieh, C-T and P J Klenow (2010) “Development accounting”, American Economic Journal: Macroeconomics, 2(1): 207–223. Jones, C I and P J Klenow (2016) “Beyond GDP? Welfare across countries and time”, American Economic Review, forthcoming. Klenow, P J and A Rodríguez-Clare (1997) “The neoclassical revival in growth economics: Has it gone too far?”, in B S Bernanke and J Rotemberg (eds), NBER Macroeconomics Annual 1997, Cambridge, MA: MIT Press. Landes, D S (1999) The wealth and poverty of nations, New York: W W Norton and Company. Ohanian, L, A Raffo, and R Rogerson (2008) “Long-term changes in labor supply and taxes: Evidence from OECD countries, 1956-2004”, Journal of Monetary Economics, 55(8): 1353–1362. Prescott, E C (2004) “Why do Americans work so much more than Europeans?”, Federal Reserve Bank of Minneapolis Quarterly Review, 28: 2–13. Prescott, E C (1998) “Needed: A theory of Total Factor Productivity”, International Economic Review, 39(3): 525-550. Ramey, V A (2009) “Time spent in home production in the 20th century United States: New estimates from old data”, Journal of Economic History, 69(1): 1–47. Ramey, V A and N Francis (2009) “A century of work and leisure”, American Economic Journal: Macroeconomics, 1(2): 189–224. It wasn’t just Caselli (2005) who reached this conclusion. The same basic failure of factor accumulation to account for income differences was emphasised by Hall and Jones (1999), Klenow and Rodriguez-Clare (1997), Prescott (1998), Hsieh and Klenow (2010) and others.